A New Year. Like any proper New Year, 2015 demands some changes from me. Or better, I decided on some changes… have you noticed the two new pages I added to my blog? Starting 2015 I’ve decided to make life a bit more logic and easy for myself. I’m determined to continue writing this blog and developing my own little business, but I can use a bit more focus and funnelling instead of drifting. And here’s my first step. You could say London is a project of mine. Or at least, writing about it. It’s a place on the planet that stole my heart and after having lived there in 2011 I started my first blog If I were in London right now, sharing my favourite places and hidden gems. As of January 2015 If I were in London right now will be part of Tessie’s Projects. It makes sense to me. I love writing, I love going to London as often as I can. But right now, writing and maintaining two separate blogs is not what my body and mind need. The old blog will keep on existing. However, when I feel the urge to share some London-related stuff I will do so at Tessie’s Projects. It will be neatly categorised under If I were in London right now. Moving on to the other new page. A page that might be interesting for you if you a) live in The Netherlands, b) are a local Dutchy living in The Netherlands who likes to meet other people or c) are an expat living in The Netherlands who likes to meet other (Dutch) people. Expat meet Local was set up by me in June 2014. You may have guessed: it’s my intention to bring expats and locals together by organising little events. During Summer these events may be picnics, in Winter we go indoors. No sane Dutch person picnics during Winter. Expats hang out with expats, locals hang out with locals. When you’re an expat you seek like-minded souls, when you’re a local you may just love your life as it is. Being a dreamer, I dreamed of changing this… wouldn’t it be just great to meet people with different backgrounds, from other countries and cultures? Then, from dreaming I moved on to realisation! 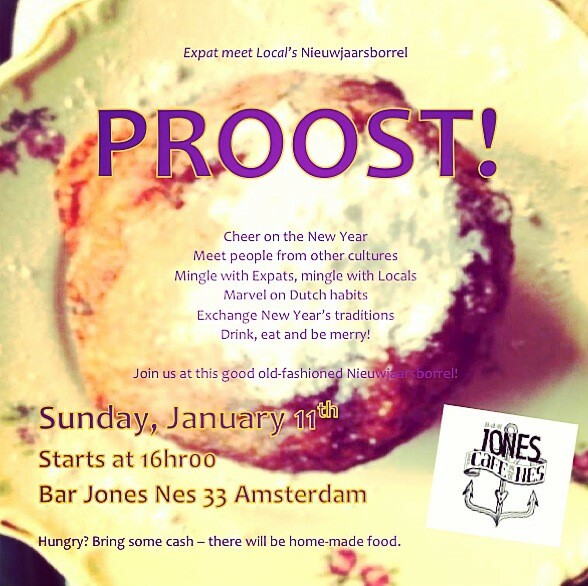 In 2015 I will continue bringing expats and locals together by organising little meet-ups. Knowing that people go home after an event with a new friend or squash-buddy, having learned and tasted something new. It brightens up my life. Simple as that! So all you expats and Dutchies, all people dreaming of moving to The Netherlands or wanting to meet new (Dutch) people? Have a look at the new page for more information on Expat meet Local and be welcome to join us at our New Years reception Sunday the 11th of January. Yes, a New Year. I hope you all will have a good one! And remember; most of the time you yourself can make your year as good as you want it to be. It’s in your hands, you are in charge. Most of the time…that is.